Protein, the building block of the body’s cells and tissues, is a very valuable and necessary dietary component. This nutrient is an essential part of a runner’s and non-runners diet. When your body is not getting enough you can almost always tell the difference. You might experience headaches or a lethargic feeling because your body is missing out on this important element that builds and repairs your body’s cells. In healthy diets it is good to take in about 25% of our food consumption as proteins. 25% might seem like a lot but many scientists argue that even that might not be enough and maybe we should be taking in as much as half of our body weight in grams. (So a 184lbs. man might need to take in as much as 92 grams of protein!) This research is very premature but what we can take away from it is that we could probably take in more of it and see health benefits. At the very least we should be consuming at about 1/3 of our body’s weight in grams. An average amount would be roughly 36 grams, give or take a few depending on how big or small you are. As a runner, and particularly a marathon runner, it is vitally important to be taking in enough protein especially before and after a long run. Protein is not going to help as far as energy metabolism goes. When you run you will be burning a large amount of carbohydrates and some fats. However you never burn through your protein stores. It is fine to eat something that has protein in it however, stay away from large amounts found in things like protein bars and shakes. Focus on taking in carbohydrates. This is more important in runs that are greater than an hour in length. 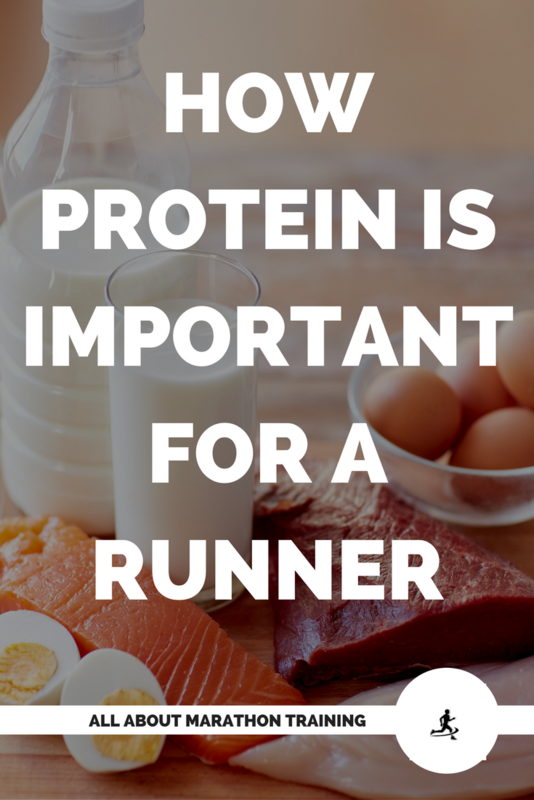 There is no need to take in protein during your run. Small amounts are fine, but the best method is to wait until after you are done running. The role of protein is escalated after a run. In order for your body to utilize protein to restore and recover damaged muscle cells to it's highest potential it is best to eat a snack high in protein no later than 30-45 minutes after a run, particularly a long run. This is because, your protein transporters are at their highest level after a run until about 30-45 minutes later. Therefore to take in protein will be the most beneficial at this time in terms of repair work capacity. If you are going on a shorter run of 45 minutes or less, you can also eat a protein snack before hand and still take advantage of the higher levels of protein transporters. A protein shake is a great way to replenish protein stores as it is easier on the digestive system. One of my favorites is chocolate milk, be sure to use whole milk! Not only will it help to recover micro-trauma that your body has undergone but protein will also help to keep your strength up in order to take on the next run. Super healthy pancake mix that will leave you feeling good! These Kodiak Protein Power Pancakes are sooo good! And honestly the only ones I really feel good about eating after I've finished. They only contain natural ingredients (yay), 7 grams of protein (yay), and no added sugars (YAY). Plus with the high protein content you don't get a huge sugar high from them. Winner, winner! Want to learn more about eating as a marathoner? Personalized to you? The Ultimate Guide to eating and fueling for marathon training and racing success! 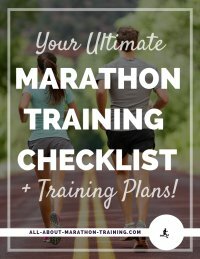 + get access and develop your own personalized marathon nutrition plan to implement before your marathon with our 9 STEP Prep Plan! 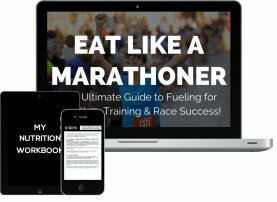 Get access to the EAT LIKE A MARATHONER Nutrition Course here!